This week in Your Parents Basement, we’re throwing down dunks for fire basketball power-ups! 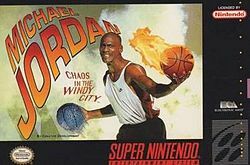 From 1994, we’re playing the much-forgotten Michael Jordan: Chaos in the Windy City, a SNES-exclusive from Electronic Arts. Today’s special guest is Steve’s buddy Dale! You can manually download this week’s wonderful podcast here, or subscribe to the show via the iTunes store. To manually subscribe, use this link in the device / podcast player of choice. You can also follow us on Twitter, or ‘like’ us on Facebook. 0:00 – The intro, which is not The Police, but is from a stage in the game. 1:00 – Todd’s not here, man. 46:00 – Emails. There could be foul play involved with this week’s show, and not enough video game questions. – According to Price Charting, a copy of Chaos in the Windy City costs about $7 for the cart itself. If you want a new copy, or just one with the box and manual, it’s around $20 to $40. – For a play-through of the game, with some commentary, check out this YouTube video. The speed run video is around 44 minutes, and available here. – There isn’t much info on this game available on the web, since it isn’t “so bad it’s funny” like Shaq Fu. (And hey, reminder – We reviewed that one too!) However, as mentioned on the show, this game was the first one designed by Amy Hennig, who would go on to design and develop some much better games. For next week’s show, we’re covering Smash TV! If you’d like to participate, shoot an email to parentsbasementpodcast@gmail.com. Recording time will be 11 p.m. EST Wednesday.